Currently, we solve three main tasks using Arabidopsis thaliana as model: 1. Genetic determination of metabolome pathway connected to prenylflavonoid and lupulin production in hop. 2. 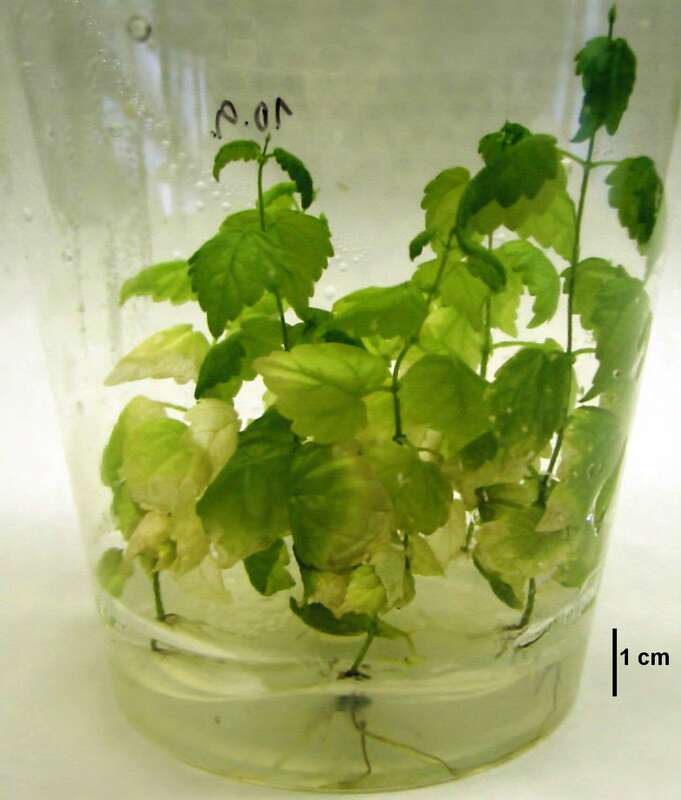 Study of pospiviroid pathogenesis in hop. 3. Biogenesis of anticancerogenic nucleases. 1. Hop (Humulus lupulus L.) is known primarily as a crop used in the brewing industry due to its ability to deliver beer bitterness and aroma. Recently, hop is being investigated due to the pharmaceutical prospects of the prenylated flavonoids produced in the lupulin glands of female cones. In many plant species the biosynthesis of flavonoids is regulated by transcription factors belonging to the MYB, bHLH, WD40, bZIP and WRKY gene families. In particular, we analyzed involvement of WRKY transcription factors in activation of the final steps of lupulin biosynthesis. We identified highly lupulin-specific transcription factor HlWRKY1 and lupulin unspecific HlWRKY5 having ability, especially when co-expressed with HlWDR1, to activate set of promoters driving key genes of prenylflavonoids and bitter acids biosynthesis pathway such as chalcone synthase, valerophenone synthase, prenyltransferase 1 and 2 and O-methyltransferase-1 (Omt1) during transient expression assays. Both WRKYs showed high similarity to WRKY75 from Arabidopsis thaliana, which regulates root development, senescence and phosphate starvation or plant defence response. In collaboration with Dr. C. Koncz (Max-Planck Institute for Plant Breeding Research in Cologne, Germany) we prepared binary transformation vector HlWRKY1/HlWDR1 (W/W). Agrobacterium-mediated transformation of hop with W/W vector led to ectopic overexpression of these transgenes and to activation of lupulin-specific OMT1 gene which could be very important for future biotechnology of hop secondary metabolome production. As WRKY and other hop TFs genes are strongly regulated by post-transcriptional gene silencing (PTGS), major focus of our study was on characterization of microRNAs (miRNAs) in hop, which are ~22-nt RNAs that specify gene repression by pairing to messenger RNAs (mRNAs) of protein-coding genes. We used combined experimental-in silico computational based approach for first time identification and characterization of miRNAs in hop. A total of 22 miRNAs belonging to 17 miRNA families were identified and validated experimentally. The new miRNAs identified in this study should enable investigation of the complexity of miRNA-mediated genes network in understanding their roles in regulating growth, development, metabolism, and other physiological processes such as cone development and transcriptional factors involved in secondary metabolite pathway most important xanthohumol production. 2. 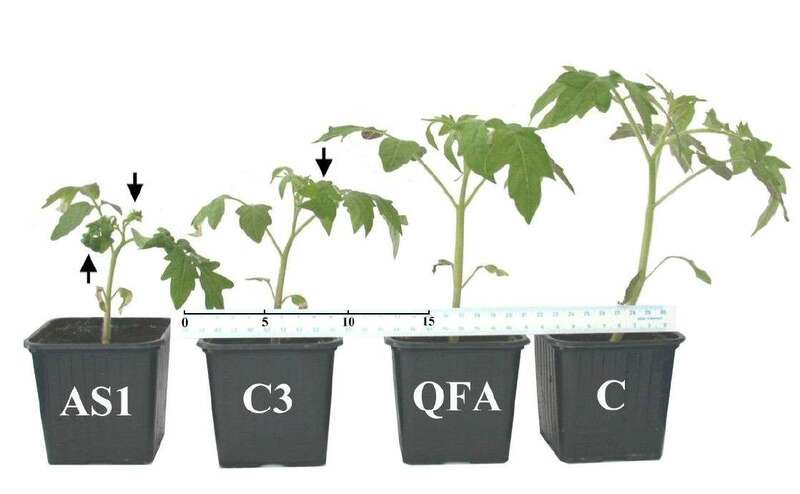 We identified new pospiviroid variants mainly in hop and some ornamental plants and analysed mechanisms of viroid pathogenesis, where target genes were identified with the help of tomato and A. thaliana asmodels. Besides regulatory genes such as R2R3Myb, we found that viroids are affecting mRNA levels of some genes in RNA silencing pathway. We also analysed the role of miRNAs in response to Citrus bark cracking viroid (CBCVd) pathogenesis in hop. We deep-sequenced two sRNA libraries prepared from healthy and CBCVd infected hop plants to investigate the miRNAs in hop and their transcriptional profile in response to CBCVd infection. With the support of MODBIOLIN we organized international viroid meeting entitled: “Viroid diseases and molecular mechanisms of viroid pathogenesis”, where the main results dealing with this subtopic were presented. 3. TBN1, a homologue of A. thaliana sugar nonspecific nuclease I from tomato has significant anticancerogenic activity. Its molecular farming in plant cells could be a non-expensive source for its biotechnology preparation. We analysed TBN1 overexpression in plant tissue to reach maximum yield for biomedical experiments. It was found that level of nuclease is significantly enhanced by co-expression of silencing suppressors p19 and p38 and is influenced by the secondary TBN1 mRNA degradation. We succeeded to establish tobacco suspension cultures stably expressing anticancerogenic nuclease that could be used for its biotechnology production. Authors: RNDr. Jaroslav Matoušek, CSc., Ing. Tomáš Kocábek, Ph.D.
Kocábek, T., Matoušek, J.: Functional and complementation analysis of hop genes in heterologous systems. Acta Horticulturae,1010: 77-84, 2013. Matoušek, J., Kocábek, T., Patzak, J.: Molecular background and networking putatively involved in regulation of lupulin gland metabolome-Results and prospects. Acta Horticulturae, 1010: 39 – 46, 2013. Matoušek J., Piernikarczyk R.J.J., Dědič P., Mertelík J., Uhlířová Kateřina, Duraisamy G. S., Orctová Ludmila, Kloudová K., Ptáček J., Steger G.: Characterization of Potato spindle tuber viroid (PSTVd) incidence and new variants from ornamentals. European Journal of Plant Pathology 138: 93-101, 2014. Matoušek, J., Piernikarczyk, R., Tycová, A., Duraisamy, G.S., Kocábek, T., Steger, G.: Expression of SANT/HTH Myb mRNA, a plant morphogenesis-regulating transcription factor, changes due to viroid infection. J. Plant Physiol., 183, 85-94, 2015. Mishra, A.K., Duraisamy, G.S., and Matoušek, J. (2015). Discovering microRNAs and their targets in Plants. Critical Review in Plant Sciences. DOI:10.1080/07352689.2015.1078614 (in press). Mishra, , Duraisamy, G.S., Týcová, A. and Matoušek, J. (2015). Computational identification of microRNAs from Expressed Sequence Tags of Humulus luplus, target predictions and expression analysis. Computational Biology and Chemistry. DOI:10.1016/j.compbiolchem.2015.09.005 (in press).